Trump wasn’t at all prepared to win the presidency. Were you shocked when Donald Trump, a man with no political experience whatsoever, won the US presidential election in 2016? If you were, you’re certainly not alone. Even Trump, not to mention the majority of his campaign team, didn’t expect that he’d win. In the weeks leading up to the election, Donald Trump kept telling his wife, Melania Trump, that things were going to go back to normal in November. Though their relationship isn’t a particularly close one, Melania resented living under the media’s microscope and having her husband’s history of adultery discussed on national news. But everyone on the campaign, including the campaign manager, Kellyanne Conway, and Jared Kushner, Trump’s son-in-law and advisor, believed the wild ride of the Trump presidential campaign was about to come to a screeching halt. Everyone was preparing their post-campaign lives and plotting their next moves. Trump planned to tell the world that the election had been stolen from him while exploring the possibility of his own television channel, the Trump Network. Conway was eager to transition her newfound notoriety into a regular media job with one of the cable-news networks. A clear proof of the victory’s unexpectedness is how unprepared many campaign members were for the scrutiny that comes with being in the White House. Donald Trump and other campaign associates like Paul Manafort have real-estate holdings that put them in a financial grey zone, with backgrounds and transactions that don’t stand up well to scrutiny. Paul Manafort only agreed to help manage the campaign because he was reassured by Jared Kushner that there was no chance they’d win, and therefore no reason he’d be subjected to any investigations. So when the results were finalized, and Trump was confirmed as the winner, everyone was in a daze, including Trump’s closest friends and most of his staff. The only one who had a suspicion that the numbers were looking good was Trump advisor Steve Bannon and his pollster, John McLaughlin. For everyone else, they were ill prepared for what lay ahead. Those in Trump’s inner circle of advisors were at constant odds with one another. The early days of the Trump presidency have been marked by an attempt to dominate, not negotiate. The Trump administration is torn between the Bannon way and the Kushner way. Firing FBI director James Comey marked a turning point for the Trump administration. Trump has a problem with reading and processing information. A meeting set up by Donald Jr. exposed more ties to Russia, and more bad decisions. Trump’s own words have repeatedly made his situation worse. 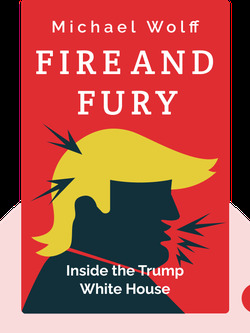 Start your free Blinkist trial to get unlimited access to key ideas from Fire and Fury and over 3,000 other nonfiction titles. With bitesize text and audio, it's easier than ever to find the right ideas to transform your life.